Japanese food is really fussy and really focused. Flavors are layered almost individually in single minded expression with little or no overlap. One dimension of a ramen bowl is the marinated egg or ajitsuke tamago. Literally this means “flavor added egg” and currently the Vogue is to offer soft boiled or half cooked eggs to go with ramen. I love eggs but never fiddled as much with them as I did making these eggs. 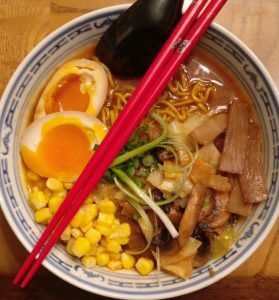 There are those who have set out recipes and guides but mastering the ramen egg just takes doing. It takes a bit of practice and the making of a lot of egg soup. I tried sous vide eggs, onsen eggs, 6, 6.5, 7 and 7.5 minute eggs. Poking them. Not poking them. Injecting them. In the end? For home kitchens the 6.5 minute egg from refrigerator to ice bath is the best egg for ramen. I recently got my hands on some pasture raised eggs and some farm fresh eggs sourced from a local henhouse. I can’t tell you how much fun this has been. I have made the mistake of making soft boiled eggs from gas station eggs. Not a good idea unless you enjoy the smell of old sulfur.